With Thanksgiving just a couple weeks away, now would be a good time to brush up your cooking skills, right? What? You don’t know how to cook? Burnt toast is your specialty? Boiling water is a mystery? This entry was posted in Four on a Theme and tagged cooking, skills on November 14, 2011 by pushtotalkteens. 2. Williams-Sonoma Essentials of Breakfast & Brunch — I was a little hesitant about this one (it was on the heavy side) but the large pictures and detailed instructions convinced me to take it home. It was worth every pound! The images are very helpful and it has a KILLER pulled pork sandwich recipe… It’s tedious and time-consuming but you will not regret it. There’s a myriad of dishes here to try. 3. The Crabapple Bakery Cupcake Cookbook by Jennifer Graham — I’ll admit there are more dessert books on this list that I originally intended, but that’s because it’s hard to go wrong with them. This gourmet cupcake book is from Austrailia (so some is in Metric, etc) but is managable. Impress your family and friends with these ulitmate cups of scrumptious cake! Even the simplest Vanilla Daisy Cupcakes give Cupcake Royale a run for its money. 4. Tapas (A Taste of Spain in America) by José Andrés — I first tried tapas at Andrés’ JALEO restaurant in Washington DC, only to fall in love. Some of the recipes are too exotic for me, but hopefully you are more courageous (I passed on the octopus). However, even for us weak-hearted chefs, there are tasty tapas such as Potato Chip Omletes, petite paellas and chicken fritters. Have a favorite restaurant/recipe/cookbook? Please share it in the comments! This entry was posted in Book Lists, Read This!, Teen Powered, Tidbits and tagged Book Reviews, cooking, written by teens on April 16, 2011 by Teen Blogger. Recently, I’ve discovered a number of fun gluten-free cookbooks. My favorite so far has been Blackbird Bakery Gluten Free. Everything I’ve tried is fun, elegant and delicious. The pancake recipe yields the best freakin’ pancakes on the planet! They are AMAZING. 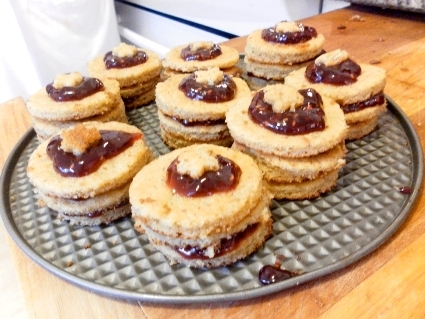 I may never use another pancake recipe again… I’ve also included a picture of some almond cakes with raspberry jam I made. This entry was posted in Read This!, Teen Powered, Tidbits and tagged Book Reviews, cooking, food, written by teens on March 12, 2011 by Teen Blogger. Would you eat something that could kill you? What if your friend ate it, how about then? Tons of people eat puffer fish every year and most live to tell the tale. Just Hungry, a blog written by Maki, a native Japanese foodie now living in Switzerland, is asking whether the casual reader would ever try puffer fish. Her post is really informative and I loved reading about how puffer fish is served and which parts of the fish are poisonous. So, would you eat puffer fish if it were offered to you? By an experienced and certified chef, of course. This entry was posted in OMG Controversy!, Tidbits, Weird and tagged cooking, food, sushi on December 5, 2009 by pushtotalkteens.